It's great to see details being published on projects that have been developed with assistance of Geometry Gym plugins for Grasshopper/Rhino. ArchDaily has posted this article on the Louisiana State Museum and Sports Hall of Fame. 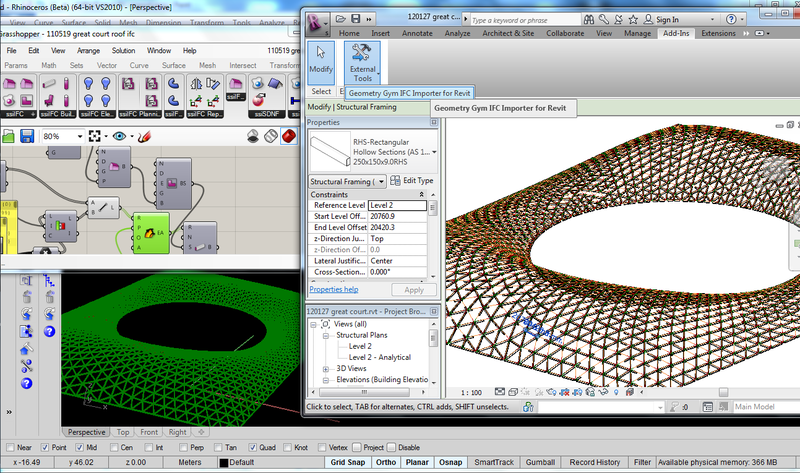 Method Design (in the design team with role as Geometry and Detailing Consultant) used the Geometry Gym plugin to exchange the Grasshopper geometric steel framing model into Autodesk Robot Structural Analysis where analysis and design checks could be conducted accurately by David Kufferman P.E. The model could then be exchanged beyond for coordination and fabrication. You can also find more details and other links by David Stasiuk on the Grasshopper website. I've recently been advancing development on a tool/workflow that's really needed to use Grasshopper to somewhere near it's full potential for Architecture/Engineering. And that's to export the model into other BIM software with strengths and functionality that are not always evident or easily accessible in Rhino. I started developing my IFC (neutral BIM format Industry Foundation Class) plugin (within Rhino/Grasshopper software) with the intent of enabling generation of BIM attributes and relationships to the already powerful geometric tool that is Rhino/Grasshopper, and then utilizing this in other BIM software without having to model everything again from scratch, and then maintaining/coordinating multiple models. I touched a little about the current use of IFC as a model exchange in my technical paper last year. Presently to be IFC certified (and there is a current drive to improve on this) you effectively need to import/export IFC models for coordination. This can be done (with accuracy but certainly not efficiency) utilizing only two shape representations, linear extrusions and meshed/faceted breps. This has led to a chicken/egg scenario, where BIM software vendors haven't imported advanced (and more efficient) shape representations (IFC is based on STEP model specification) because other vendors haven't exported them, and vice versa. So whilst there is a long list of Software that interacts with IFC, it's really difficult (and I've discussed this with a number of big and small design firms in the past year or two) to use this "bridge" as it's intended. Autodesk Revit is a very popular tool for Architects/Engineers to document and detail their projects. However testing of means to import models using neutral BIM formats (primarily IFC and SDNF) hasn't resulted in much to boast about and utilize. SDNF can generate native beam elements but can take hours (without succeeding) to import a pratical size roof model. The Autodesk IFC plugin import generates reference objects, useful for coordination, drawing and even schedules, but as soon as you wish to edit or manipulate the objects, you nearly need to model it again (as families aren't utilized and aspects such as analytical representations not created). So, with a few Geometry Gym users looking for a work flow to get Grasshopper models into Revit, I've been looking for improved ways to do this using the Revit SDK. I started looking at direct model interaction, but for technical and practical reasons have decided a neutral bridge is the best way to do this. Most of my c# IFC code is reusable (with some interaction changes) as a Revit plugin (this is my first plugin outside of the Rhino/Grasshopper environment), and I've today posted an example import of a steel frame roof (British Museum Great Court Roof) using my own IFC engine. There's lots of improvements and work to do, but I'm confident with time I can create a powerful IFC engine within Revit (as I've already achieved within Rhino/Grasshopper). The priorities for improvements are being driven by real project use of this tool (let me know if you have your own use for it) and will include curved members, orientations and synchronization options. If you look closely at the image you'll see Revit has still tried to be clever with the bevel/miter at element connections, hopefully I can find a way to disable this (as an option) as I believe its significantly part of a slow import process. Other objects including slabs, walls, MEP, etc etc will also be quickly added to the toolset. It will be interesting to encounter the other hurdles and pitfalls in front of this development, but stay tuned to the blog for public release of this tool and examples of it's use. Feel free to get in touch to learn more (and influence it's development) in the interim.